As Ken Burgess spent the 2013 session lobbying for charter schools, some of his clients were nervous. They didn’t think Burgess had a bill that went far enough — or provided enough money — to help charter schools pay for their building needs. Burgess preached patience. He said the bill had a “built-in escalator,” which would pay off in time. The numbers bear this out. The charter facilities budget line item has grown annually. The state has earmarked $8.8 million for the program next year — more than four times as much as the first-year appropriation. When that money comes in, the state will have quietly spent more than $40 million in state tax dollars on charter facilities. And unlike traditional public schools, charter schools do not have to go to local taxpayers for support. The state money comes in without a vote. The state’s support doesn’t make running a charter school “idiot-proof,” said Scott Thomson, executive director of North Idaho STEM Charter Academy in Rathdrum. But that shouldn’t be the idea. There are two sides to the coin that is Idaho’s school building conundrum. While traditional schools have to secure voter support for plant facilities levies and bonds — and the latter requires two-thirds supermajority support — they also have access to local property tax dollars. Charter schools cannot tap into local taxes. And since Idaho’s first charter schools opened two decades ago, administrators have struggled to cover building costs. The 2013 law uses some dizzying arithmetic to alleviate the pressure on charters. Put as simply as possible, the law provides charters with a stipend for building projects, based on how much traditional schools spend on their buildings. When the law went to effect in 2013, the state tallied up the sum of school bond issues and plant facilities levies, dividing this number by student enrollment in the traditional schools. The charters then received a 20 percent cut — again, a dollar figure based on enrollment. The charters’ share has increased over time, an increase tied to overall increases in the state’s K-12 budget. The charters now get a 50 percent cut, a result of the “built-in escalator” Burgess described to his clients six years ago. The law caps the match at 50 percent. But even so, the payments can continue to grow, for several reasons. As more traditional schools pass bond issues, the value of the charters’ match increases accordingly. And since the money is awarded on a per-pupil basis, charters will receive more state funding as enrollment increases. Every charter school gets a share of the money — prorated, based on size. But because every school qualified for funding, that means more than $30,000 of state money went to charter schools that later closed. Meanwhile, state taxpayer dollars went to schools that are now under state Public Charter School Commission investigation. From 2014 through 2018, the Blackfoot Charter Community Learning Center received close to $690,000. Bingham Academy received close to $120,000. The Village Charter School in Boise received slightly more than $490,000. It’s still unclear exactly how much the charters will receive in 2018-19 — the State Department of Education says it will have final numbers in May. The department would not project how much the individual schools could receive in 2019-20. From 2014 through 2018, Boise’s Sage International School received more than $1.25 million from the state to offset building costs. The payments cover a significant portion of the school’s building payments of $721,000 per year, executive director Keith Donahue says. Nampa’s Idaho Arts Charter School received $1.3 million from 2014 through 2018. (Only Eagle’s North Star Charter School received more during that time.) Still, Idaho Arts’ money has covered only about a third of its bond payments, administrator Jackie Collins said. North Idaho STEM Charter Academy has used its $609,000 to help pay the mortgage on a new elementary school building. The academy opened in 2012-13 in portables, which remain in use for seventh through 12thgrades, Thomson said. The online-based Idaho Virtual Academy received more than $763,000, and head of school Kelly Edginton says the money helps cover the cost of its physical site in Meridian. The building houses office staff, face-to-face special education courses, student testing, staff training and school events. Garden City’s Anser Charter School’s $511,000 has helped the school replace items such as an aging gym floor, and offset a mortgage signed in 2009. The money doesn’t cover bells and whistles that students and parents will notice, but the state’s help is “very necessary,” organization director Heather Dennis said. The charter payments were never designed to cover a charter’s entire building budget, Burgess said. However, the bill was built to get through a skeptical Legislature. “If it was $10 more, I don’t think we could have gotten it done,” he said this week. The bill passed over bipartisan objections. Former Sen. Dean Cameron — a Rupert Republican and co-chair of the Joint Finance-Appropriations Committee — debated against the bill on the Senate floor, warning that it set a troubling precedent. Other key Republicans on JFAC voted no, including former Sen. Shawn Keough, R-Sandpoint, and Rep. Maxine Bell, R-Jerome. No Democrat supported the bill. The bill was controversial, for a reason that Burgess doesn’t like to broadcast. Lawmakers were being asked to do something they had never done before, for traditional schools or charter schools. They were being asked to put state dollars directly into local school buildings. And the plan wasn’t even a first choice among some charter school backers, Burgess said. They had other ideas — including one that would find traction six years later. The state’s money hasn’t entirely erased the funding gap that existed in 2013. Charters now receive $445 per student to cover building projects, according to a January report from Bellwether Education Partners, a pro-charter think tank. Traditional schools receive $1,206 per student, a combination of local tax dollars and indirect state assistance. This isn’t all bad, said Terry Ryan, CEO of Bluum Inc., a Boise nonprofit that promotes school choice. There is a benefit, he said, to learning to be “grittier.” At least to a point. “Money does matter,” he said. Some charter advocates want the state to increase its building payments, Ryan said, while others recognize that dollars are tight, for public schools of all stripes. That’s why the charter community coalesced behind the idea of convincing the state to back charter school bond issues. The idea is to help charters save money on financing, freeing up dollars for classroom operations. But it isn’t a new idea. It was discussed in the days leading up to the 2013 session. “The Legislature wasn’t necessarily inclined to do that,” Burgess said. Times change. So do political realities. This year, it took the Legislature only two weeks to push through a “moral obligation” bill that will back some charter school building projects. Only two lawmakers opposed the bill. Gov. Brad Little signed it into law Wednesday. 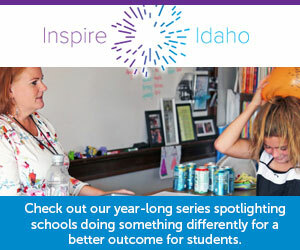 Disclosure: Idaho Education News and Bluum receive grant funding from the J.A. and Kathryn Albertson Family Foundation.